Princess Zahra Aga Khan is the eldest child of His Highness Aga Khan and she continues her family's famous passion for thoroughbred racing and breeding as both an owner and breeder, including Prix Vermeille winner and 2006 European Champion 3-year-old filly Mandesha. Princess Zahra Aga Khan is a Harvard graduate and she is the Head of the Social Welfare Department of the Aga Khan Development Network, a humanitarian NGO with 80,000 employees in 30 countries. The Opening Ceremony follows the Bureau meetings of the Asian Pattern Committee, International Stewards' Conference, Asian-African Tote Association and Asian Racing Federation Management Committee meetings earlier on Monday, January 26th. Former UK jockey Hayley Turner, who retired in August, joins the panel of media personalities on Wednesday, Jan. 27, for the Racing Media and the 21st Century Fan session where the panel will discuss how the sport engages with its fans in a fast changing media environment. Hayley Turner, who joins UK racing broadcaster At The Races, had 764 career wins including a Shergar Cup at Ascot and international Group race victories. The Racing Media session also includes topics on race calling and commentary, the art in sport – the fusion of television and racing and the future of racing journalism. The 36th Asian Racing Conference official site is arcindia2016.com. This entry was posted in The Biz and tagged asian pattern committee, asian racing conference, h.h. the aga khan, Hayley Turner, princess zahra aga khan by Press Release. Well, look who’s going to be here! Hardly has the dust settled with international athletes exiting Mumbai after the its annual marathon, and we will have hordes of overseas guests descending on the city for the Asian Racing Conference (ARC) scheduled from January 24-29. This is a prestigious event, for all those connected with the horse racing industry. Mahalaxmi racecourse will be in focus, as delegates from Asia, debate and discuss how to take racing ahead in their countries and across the world. One of the visitors will be Princess Zahra Aga Khan, daughter of Aga Khan IV. She and thoroughbred racing are connected. She is a horse owner and races thoroughbreds in her name. Meanwhile, we see Mahalaxmi getting all spruced up. The washrooms are sparkling, the stands have a fresh coat of paint and there are new ekdum English-style benches on the lawns. The green emerald of SoBo just got extra sheen. Copyright © 2014 Mid-Day Infomedia Ltd. All rights reserverd. Princess Zahra Khan, (centre), daughter of Aga Khan, wears a sari at the Mahalaxmi Racecourse yesterday. Here she is pictured with Cyrus Poonawalla and his socialite daughter-in-law Natasha. In the 20th century my grandfather and great-grandfather also raced their horses throughout India, to win races like the Indian Oaks with Ferial in 1945, four Viceroy’s Cups between 1928 and 1940, seven Eclipse Stakes of India between 1926 and 1956… and in 1922 my great-grandfather bought his foundation mares with Major Hall in Newmarket. Included in those lots was Mumtaz Mahal the “flying filly”, and her blood still runs in the veins of our families today, and in mares like Zafayra and To The Manor Born who are in the Indian Studbook. My father, His Highness the Aga Khan, has maintained this family tradition for 55 years, winning an international total of 15 Derbies, 13 Guineas, 7 Prix de Diane, 4 Arcs – but not the Indian Oaks… yet! How have these families survived and flourished through 250 years and six generations of the Aga Khan family? Along with all the usual variables that we breeders look at such as conformation, distance aptitudes, character, physical fragilities, etc., we have an explicit policy of maintaining the genetic diversity of our broodmare band. We are constantly trying new matings and sire-lines, to try to preserve our families and revive those who have gone dormant. Take for example the expanse of time between Petite Etoile’s last Group 1 win in the 1961 Coronation stakes, and the next Group 1 win by a filly from that family, Zainta’s 1998 St Alary: it took 37 years to revive that branch of Mumtaz Mahal’s line, but when it was revived, it gave us Zarkava, probably the best filly ever bred under my father’s ownership. This is thanks to my father’s perseverance, but possibly also thanks to the variable that we consider the least when taking our breeding decisions: cost. I do not mean that we go to the most expensive stallions and are blind to the expense - quite the contrary. You will often see good Aga Khan mares visiting unfashionable and affordable stallions, and you may wonder… why? For one thing it is because we run our bloodstock operation as a business, with solid principles and financial caution, a constant quest for excellence and respect for best practices – but, perhaps more importantly, it is because we consider the pedigree first, and the market last. We are very fortunate to be able to take our breeding decisions based purely on the “fit” between the mare and the stallion, and not based on the eventual sales value of the yearling or the foal. As traditional breeders we have the luxury of protecting our families by making sure that we do our very best every single year to find the best horse for each mare, regardless of the commercial appeal. Of course, we have to sell some stock every year to keep the numbers manageable, but this is not driven by a financial imperative. In short, we do not follow fashion: we can decide whether we feel a horse will make a good mate for one of our families. The cost of a nomination used to be dictated by the success of that stallion’s offspring on the racecourse, but more and more often it is now driven by vogue. An unproven first-season sire can command prices that are entirely unrelated to his ability to pass on, speed or strength or bone, or even the viability of his genes as a thoroughbred. On the other hand, stallions are judged within a very few years and retired to exotic locations for misdemeanour offenses in their first two crops. It is a shame because sometimes we find out too late that such and such a horse would have made a good sire or a good broodmare sire. How can we ensure the future of the breed if every year hundreds of mares are mated to unproven first season sires that are completely unproven and statistically, likely to fail? What happens to the hundreds of foals that will never make good race-horses? How can we preserve the genetic diversity of the breed, and avoid fashions that focus solely on speed or precocity of one sire-line, at the expense of those other sire-lines who may eventually produce the great champions of the future? How can we maintain and improve the genetic capital of the thoroughbred and expand the gene pool, rather than reducing it for short-term, profit-driven purposes? The answer may be a question of cycles. The “horse business” was much more patient in the past, allowing years to pass before mares and stallion were given either a pedestal, or a push into the dungeons of the forgotten. Today, breeders and owners expect rapid returns from their investments but frankly, the breeding business cannot be rushed. Nature dictates, and all the trendiness in the world won’t prove a stallion successful because of a sales catalogue. Judging success should be confined to the results achieved on the great racecourses of the world and not in the sales ring. In centuries to come, the thoroughbred would be better off possibly, if breeders concentrated on the horse, rather than the sale of the horse, and the stallion as a viable procreator, rather than as a source of profit. Racing and breeding have always been seen as a high-end activities, a frivolity associated with silly hats but I would like to underline the fact that 90% of the time and effort involved in creating a race horse are anchored in the rural economy and most of us spend far more time in our welly-boots than in our top hats. The horse industry is an important part of the rural economy, employing millions of people around the world in areas of shrinking agricultural production. It supports farms and villages, it provides permanent, year-round employment to riders, lads, farriers, vets, farmers and businesses of all kinds. As my father said, “You can look at the horse in human life — in agriculture, in war, or as a vehicle of exploration — for hundreds of years. When you think about it, the horse is one of the most extraordinary phenomena we have.” This industry preserves a species, and also an entire population that nurtures that species. I may have given the impression that breeding plays a central role in my family’s activities, but in fact, for the Aga Khan family, it’s a “weekend job”, it’s a peripheral activity. As many people know, we spend 99% of our time working on development projects in Africa, and South and Central Asia, and in many sectors, from micro-finance to healthcare and education, from agro-industry to rural development, including here in India where our institutions have been present for more than a hundred years. This means that the business of breeding and racing horses has to fit into the limited amount of time that can be devoted to hobbies, and we are lucky to have a team of dedicated and highly-qualified colleagues who do a great job of handling “the business” on a daily basis. Nevertheless, I think that this “weekend job” is an important one, because it represents 250 years of family tradition, and it maintains ties with our Persian and Indian history. Many of the families in our studbook have been with us since 1922, and they are old friends. In 1939 my great -grandfather won the King Emperor’s Cup in Calcutta with Baqlava, a horse from the same family as Shahrastani, a family still present in our stud book today. In 1942 he won the Eclipse Stakes of India here at Mahalakshmi, with Golden Fawn, from the Mumtaz Mahal family. Today there are 125 mares from the same family in the Indian Studbook, and it has won more prize-money than any other in this country. Two of the top first-season sires in India, Arazan and Varenar, are Aga Khan-born and raced. Last Friday, Angel Dust won the Bangalore Derby – she is out of an Aga Khan mare. We are proud and honoured to be associated with racing and breeding in India and around the world after so many years and so many generations, and we intend to continue this time-honoured tradition. 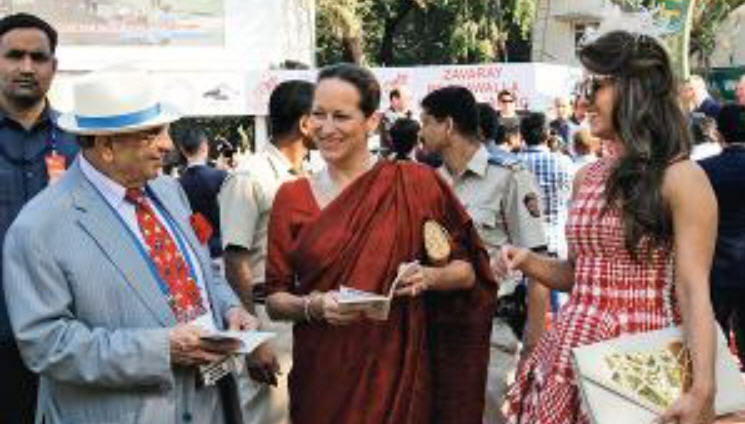 After a few introductory remarks in her opening address at the opening ceremony of the Asian Racing Conference Jan. 25 at the National Sports Club of India in Mumbai, Princess Zahra Aga Khan provided some in-depth thoughts on Thoroughbred breeding, calling for more patience. Her opening address, in its entirety, follows. Included in those horses in the late 19th century, were Shere Ali, who won the Arab Derby in 1869, Khusroo who won the Winner's Handicap in 1870, and Maharaj, who won loads of stuff including the Governor's Cup and the Derby in 1872. In the 20th century my grandfather and great-grandfather also raced their horses throughout India, to win races like the Indian Oaks with Ferial in 1945, four Viceroy's Cups between 1928 and 1940, seven Eclipse Stakes of India between 1926 and 1956... and in 1922 my great-grandfather bought his foundation mares with Major Hall in Newmarket. Included in those lots was Mumtaz Mahal the "flying filly", and her blood still runs in the veins of our families today, and in mares like Zafayra and To The Manor Born who are in the Indian Studbook. My father, His Highness the Aga Khan, has maintained this family tradition for 55 years, winning an international total of 15 Derbies, 13 Guineas, 7 Prix de Diane, four Arcs—but not the Indian Oaks ... yet! Along with all the usual variables that we breeders look at such as conformation, distance aptitudes, character, physical fragilities, etc., we have an explicit policy of maintaining the genetic diversity of our broodmare band. We are constantly trying new matings and sire lines to try to preserve our families and revive those who have gone dormant. Take for example the expanse of time between Petite Etoile's last group I win in the 1961 Coronation Stakes, and the next group I win by a filly from that family—Zainta's 1998 St Alary. It took 37 years to revive that branch of Mumtaz Mahal's line, but when it was revived, it gave us Zarkava, probably the best filly ever bred under my father's ownership. This is thanks to my father's perseverance, but possibly also thanks to the variable that we consider the least when taking our breeding decisions: cost. I do not mean that we go to the most expensive stallions and are blind to the expense—quite the contrary. You will often see good Aga Khan mares visiting unfashionable and affordable stallions, and you may wonder ... why? For one thing it is because we run our bloodstock operation as a business, with solid principles and financial caution, a constant quest for excellence and respect for best practices but, perhaps more importantly, it is because we consider the pedigree first, and the market last. We are very fortunate to be able to take our breeding decisions based purely on the "fit" between the mare and the stallion, and not based on the eventual sales value of the yearling or the foal. As traditional breeders we have the luxury of protecting our families by making sure that we do our very best every single year to find the best horse for each mare, regardless of the commercial appeal. Of course, we have to sell some stock every year to keep the numbers manageable, but this is not driven by a financial imperative. In short, we do not follow fashion: we can decide whether we feel a horse will make a good mate for one of our families. The cost of a nomination used to be dictated by the success of that stallion's offspring on the racecourse, but more and more often it is now driven by vogue. An unproven first-season sire can command prices that are entirely unrelated to his ability to pass on, speed, or strength or bone, or even the viability of his genes as a Thoroughbred. On the other hand, stallions are judged within a very few years and retired to exotic locations for misdemeanour offenses in their first two crops. It is a shame because sometimes we find out too late that such and such a horse would have made a good sire or a good broodmare sire. How can we ensure the future of the breed if every year hundreds of mares are mated to unproven first-season sires that are completely unproven and statistically, likely to fail? What happens to the hundreds of foals that will never make good racehorses? How can we preserve the genetic diversity of the breed, and avoid fashions that focus solely on speed or precocity of one sire-line, at the expense of those other sire-lines who may eventually produce the great champions of the future? How can we maintain and improve the genetic capital of the Thoroughbred and expand the gene pool, rather than reducing it for short-term, profit-driven purposes? The answer may be a question of cycles. The "horse business" was much more patient in the past, allowing years to pass before mares and stallion were given either a pedestal, or a push into the dungeons of the forgotten. Today, breeders and owners expect rapid returns from their investments but frankly, the breeding business cannot be rushed. Nature dictates, and all the trendiness in the world won't prove a stallion successful because of a sales catalog. Judging success should be confined to the results achieved on the great racecourses of the world and not in the sales ring. Racing and breeding have always been seen as high-end activities, a frivolity associated with silly hats, but I would like to underline the fact that 90% of the time and effort involved in creating a racehorse are anchored in the rural economy and most of us spend far more time in our welly-boots than in our top hats. As my father said, "You can look at the horse in human life—in agriculture, in war, or as a vehicle of exploration—for hundreds of years. When you think about it, the horse is one of the most extraordinary phenomena we have." This industry preserves a species, and also an entire population that nurtures that species. I may have given the impression that breeding plays a central role in my family's activities, but in fact, for the Aga Khan family, it's a "weekend job," it's a peripheral activity. As many people know, we spend 99% of our time working on development projects in Africa, and South and Central Asia, and in many sectors, from micro-finance to healthcare and education, from agro-industry to rural development, including here in India where our institutions have been present for more than a hundred years. This means that the business of breeding and racing horses has to fit into the limited amount of time that can be devoted to hobbies, and we are lucky to have a team of dedicated and highly qualified colleagues who do a great job of handling "the business" on a daily basis. Nevertheless, I think that this "weekend job" is an important one, because it represents 250 years of family tradition, and it maintains ties with our Persian and Indian history. Many of the families in our studbook have been with us since 1922, and they are old friends. In 1939 my great-grandfather won the King Emperor's Cup in Calcutta with Baqlava, a horse from the same family as Shahrastani, a family still present in our stud book today. In 1942 he won the Eclipse Stakes of India here at Mahalakshmi, with Golden Fawn, from the Mumtaz Mahal family. Today there are 125 mares from the same family in the Indian stud book, and it has won more prize money than any other in this country. Two of the top first-season sires in India, Arazan and Varenar, are Aga Khan-born and -raced. Last Friday, Angel Dust won the Bangalore Derby—she is out of an Aga Khan mare. We are proud and honoured to be associated with racing and breeding in India and around the world after so many years and so many generations, and we intend to continue this time-honored tradition. La princesse a ouvert la 36e conférence asiatiques des courses à Mumbai (Inde) par un discours riche et intéressant, que nous livrons en intégralité. Au cours du 19e siècle, les chevaux de mon arrière-arrière-arrière-grand-père participaient à des courses à travers toute l’Inde indivisée. Il les avait amenés depuis la Perse, où sa famille élevait des chevaux depuis de nombreuses générations. A la fin du 19ème siècle se trouvaient parmi ces chevaux Shere Ali, gagnant du Derby Arabe en 1869, Khusroo, vainqueur du Winner’s Handicap en 1870 et Maharaj, qui gagna de nombreuses courses, dont la Governor’s Cup et le Derby en 1872. Au cours du 20ème siècle, mon grand-père et mon arrière-grand-père eurent eux aussi des chevaux de courses en Inde et remportèrent des courses telles que les Oaks Indiennes avec Ferial en 1945, quatre Viceroy’s Cup entre 1928 et 1940, sept Eclipse Stakes d’Inde entre 1926 et 1956… et en 1922, mon arrière-grand-père acheta ses juments fondatrices avec le Colonel Hall à Newmarket. Parmi ces chevaux se trouvait Mumtaz Mahal, la « pouliche volante », et son sang coule encore dans les veines de nos familles aujourd’hui, et de juments telles que Zafayra et To The Manor Born, qui font partie du Studbook Indien. Mon père, Son Altesse l’Aga Khan, a maintenu cette tradition familiale pendant 55 ans, remportant un total de 15 Derbies, 13 Guinées, 7 Prix de Diane, 4 Prix de l’Arc de Triomphe – mais pas les Oaks Indiennes… à ce jour ! Comment ces familles ont-elles survécu et se sont-elles développées à travers 250 ans et six générations de la famille Aga Khan ? Au-delà des facteurs habituels auxquels les éleveurs prêtent attention tels que la conformation, l’aptitude aux distances, le tempérament, les fragilités physiques, etc., nous avons une politique explicite de maintenir une diversité génétique au sein de notre jumenterie. Nous essayons constamment de nouveaux croisements et de nouvelles lignées d’étalons, afin de préserver nos familles et de réveiller celles qui sont dormantes. Prenez par exemple le nombre d’années qui séparent la dernière victoire de Groupe 1 de Petite Etoile dans les Coronation Stakes, en 1961, et le Groupe 1 suivant remporté par une pouliche de cette famille, Zainta, dans le Prix Saint Alary, en 1998 : il a fallu 37 années pour raviver cette branche de la famille de Mumtaz Mahal, mais une fois ravivée, elle nous a donné Zarkava, probablement la meilleure pouliche jamais élevée sous l’égide de mon père. C’est grâce à la persévérance de mon père, mais peut-être aussi grâce à une variable que nous considérons le moins lorsque nous réalisons nos croisements : le coût. Je ne veux pas dire que nous allons aux étalons les plus chers et ne tenons pas compte des dépenses – bien au contraire. Vous verrez souvent de bonnes juments Aga Khan aller à des étalons qui ne sont pas à la mode et peu chers, et vous vous demanderez peut-être… pourquoi ? L’une des raisons à cela est que nous conduisons notre élevage comme une entreprise, avec de solides principes et prudence financière, une quête constante de l’excellence et un respect des bonnes pratiques – mais aussi, et peut être est-ce le plus important, nous considérons le pedigree en premier, et le marché en dernier. Nous sommes très chanceux de pouvoir effectuer nos choix de croisement en nous basant uniquement sur « l’adéquation » entre une jument et un étalon, et non en nous basant sur la valeur de vente d’un yearling ou d’un foal. En tant qu’éleveur traditionnel, nous avons le luxe de pouvoir protéger nos familles en nous assurant de faire de notre mieux chaque année pour trouver le meilleur étalon pour chaque jument, indépendamment de l’attrait commercial. Bien sûr, il nous est nécessaire de vendre des chevaux chaque année pour garder des nombres gérables, mais cela n’est pas déterminé par un impératif financier. En résumé, nous ne suivons pas la mode : nous pouvons décider si nous pensons qu’un cheval fera un bon croisement avec l’une de nos familles. la force ou de l’os, ou même la viabilité de ses gênes en tant que pur-sang. En revanche, les étalons sont jugés en l’espace de quelques années seulement et envoyés vers des destinations exotiques en cas de manquements mineurs dans leurs deux premières générations. Cela est regrettable, car nous nous apercevons parfois trop tard que tel ou tel cheval aurait fait un bon étalon ou un bon père de mères. Comment pouvons-nous assurer le futur de la race si chaque année des centaines de juments sont croisées avec des étalons de première production qui ne sont absolument pas prouvés et ont statistiquement de grandes chances d’échouer ? Qu’advient-il des centaines de foals qui ne deviendront jamais de bons chevaux de courses ? Comment pouvons-nous préserver la diversité génétique de la race et éviter les modes qui se concentrent uniquement sur la vitesse et la précocité d’une lignée d’étalons, aux dépens d’autres lignées d’étalons qui pourraient finalement produire les grands champions du futur ? Comment pouvons-nous maintenir et améliorer le capital génétique du pur-sang et accroître son patrimoine génétique, plutôt que de le réduire pour des objectifs commerciaux à court-terme ? La réponse est peut-être une question de cycles. « L’industrie du cheval » était bien plus patiente par le passé, permettant d’attendre plusieurs années avant qu’une jument ou un étalon ne soit mis sur un piédestal, ou jeté aux oubliettes. Aujourd’hui, éleveurs et propriétaires attendent un retour sur investissement rapide, mais franchement, l’élevage ne peut être précipité. La nature prévaut, et toutes les modes du monde ne feront pas d’un étalon un succès grâce à un catalogue de ventes. L’évaluation de la réussite devrait se fonder sur les résultats accomplis sur les grands champs de courses de ce monde, et non sur les rings de vente. Dans les siècles à venir, le pur-sang se porterait peut être mieux si les éleveurs se concentraient sur le cheval, plutôt que sur sa vente, et sur l’étalon en tant que reproducteur viable, plutôt que comme une source de profit. Les courses et l’élevage ont toujours été perçus comme des activités haut de gamme, une frivolité associée à des chapeaux extravagants, mais je voudrais souligner que 90% du temps et des efforts consacrés à créer un cheval de courses sont ancrés dans une économie rurale et bon nombre d’entre nous passent bien plus de temps dans des bottes que sous un grand chapeau. cavaliers, palefreniers, maréchaux-ferrants, vétérinaires, fermiers et entreprises de toutes sortes. Comme mon père le disait, « On peut considérer le cheval dans la vie humaine – en agriculture, en temps de guerre, ou en tant que moyen d’exploration – à travers des centaines d’années. Quand on y pense, le cheval est l’un des phénomènes les plus extraordinaires que l’on ait. » Cette industrie préserve une espèce, ainsi qu’une population entière qui en prend soin. J’ai peut-être donné l’impression que l’élevage joue un rôle central dans les activités de ma famille, mais en réalité, pour la famille Aga Khan, il s’agit d’un « métier du weekend », d’une activité périphérique. Comme beaucoup de personnes le savent, nous passons 99% de notre temps à travailler sur des projets de développement en Afrique, en Asie Centrale et du Sud, dans de nombreux secteurs d’activité, de la microfinance à la santé et l’éducation, de l’industrie agricole au développement rural, notamment ici en Inde, où nos institutions sont présentes depuis plus de cent ans. Cela signifie que les activités d’élevage et de courses doivent rentrer dans le petit créneau de temps que l’on peut consacrer aux hobbies, et nous avons la chance d’avoir une équipe de collègues très qualifiés et dévoués qui réalisent un excellent travail pour faire fonctionner « l’entreprise » au quotidien. Cependant, je pense que ce « métier du weekend » est important, car il représente 250 ans de tradition familiale et conserve les liens avec notre histoire en Perse et en Inde. Bon nombre des familles de notre jumenterie sont avec nous depuis 1922 et sont de vielles amies. En 1939, mon arrière-grand-père remporta la King Emperor’s Cup à Calcutta avec Baqlava, un cheval de la famille de Shahrastani, qui est aujourd’hui toujours présente dans notre stud book. En 1942, il gagna les Eclipse Stakes d’Inde ici à Mahalakshmi avec Golden Fawn, issu de la famille de Mumtaz Mahal. Aujourd’hui, il y a 125 juments de cette même famille dans le Studbook d’Inde, et elle y a remporté plus de gains que dans tout autre pays. Deux des meilleurs étalons de première production en Inde, Arazan et Varenar, sont des chevaux qui ont été élevés et ont couru sous les couleurs Aga Khan. Vendredi dernier, Angel Dust a remporté le Derby de Bangalore – elle est issue d’une jument Aga Khan. Nous sommes fiers et honorés d’être associés aux courses et à l’élevage en Inde et à travers le monde après tant d’années et de générations, et nous avons l’intention de perpétuer cette tradition ancestrale. The Asian Racing Conference, (ARC) is staged by members of the Asian Racing Federation (ARF) every 2 years. The ARF is the peak regional body for thoroughbred racing in Asia, Australasia, Arabia and South Africa. Members & delegates from 40 countries are expected to attend the conference to be held in India after 19 years. 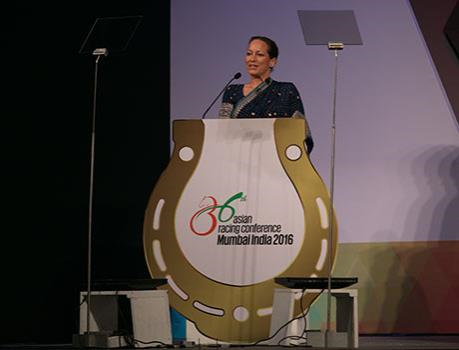 The Princess Zahra Aga Khan spoke on Monday at the Asian Racing Conference in Mumbai, India, urging breeders to consider a horse's pedigree before its commercial value. That theory is what has led her family to success in breeding for so many generations, said the Princess in her address, which you can hear in its entirety on agakhanstuds.com. “We have an explicit policy of maintaining the genetic diversity of our broodmare band,” said the Princess. “We are constantly trying new matings and sire lines to try to preserve our families and revive those who have gone dormant.” By way of example, the Princess listed the line of Mumtaz Mahal, which had gone dormant for nearly 37 years, but recently gave way to Zarkava, undefeated champion and winner of the 2008 Prix de l'Arc de Triomphe. For the entire address, read on at agakhanstuds.com.